VietNamNet Bridge – An economics-scientific-servicing complex, called Platform DK1, has served as the country’s sovereignty marker in the waters over the past 25 years. DK1 was set up on July 5, 1989 on the continental shelf belonging to the Vung Tau-Con Dao Special Zone (now southern Ba Ria-Vung Tau Province) with the task of defending the country’s sovereignty over the waters in the southeastern region. It is a complex of structures of large steel pipes which strike roots deep into dry coral reefs. Covering these steel pipes is a living space for soldiers who guard the platform. The establishment of DK1 reflected the great determination of the Party and State to develop the marine economy and create a connection between the mainland and the Truong Sa (Spratly) archipelago, thus affirming Vietnam’s sovereignty over this area and safeguarding the national territory and waters. A quarter of a century has elapsed with numerous difficulties, hardships and sacrifices but DK1 soldiers have overcome all to protect the country’s sovereignty and legitimate interests. The platforms now form a steel belt standing in the East Sea to assert Vietnam’s sovereignty over its continental shelf and serve as a base for fishermen to work at sea. The severe marine climate can stain and even damage materials and weapons, but cannot erode the spirit of DK1 soldiers who are day and night defending the sacred sea and island sovereignty of the nation. Major Bui Xuan Bong, Commander of DK1, one of the longest-serving officers on the complex with 24 years, said that despite severe weather conditions and heavy tasks, all soldiers there are enthusiastic with their job and ready to sacrifice their lives to protect the national sea and island sovereignty. Assigned to serve there for the first time, Sen. Lieut. Dau Cong Tuan, political commissar at the platforms, confided that he feels very proud of going to work at the complex, a heroic unit awarded the title “Hero of the People’s Armed Forces by the State. “Despite heavy tasks, I will always stand side by side with my comrades in arms to safeguard the country,” he said. Over the past 25 years, generations of officers and soldiers have devoted their youth to building and preserving the platforms. Many of them laid down their lives to keep the national flag proudly fluttering at sea. In addition to severe weather conditions, DK1 soldiers have also faced complicated and unpredictable situations from the wicked schemes and tricks by hostile forces who always seek to invade Vietnam’s waters. To deal with all possible cases, they must put place themselves under hard training to improve their capacity and combat readiness, and to harden their will to firmly defend the national sovereignty as well as ensure a peaceful and stable environment in the East Sea. Despite living far from the mainland, officers and soldiers on the DK1still maintain all training and normal daily activities. 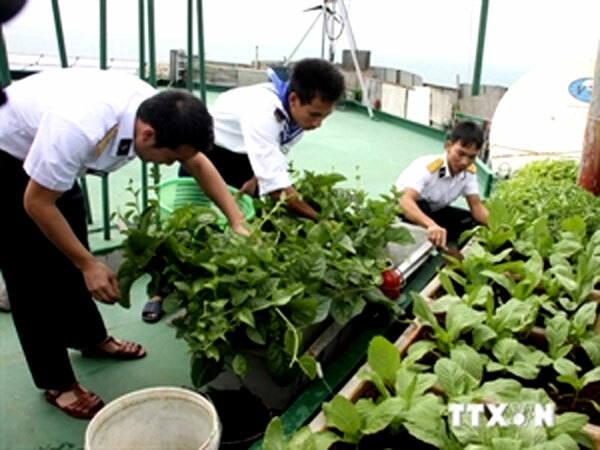 It is unimaginable that on an area of over100 sq.m and in severe weather conditions, soldiers here still grow vegetables and raise livestock like in the mainland. Before leaving for the platform, political commissar Tuan said he wants to tell those in the rear that amid current tensions in the East Sea, he and his comrades in arms always consider the safeguarding of the nation’s continental shelf as the leading task. “We will firmly hold our guns and be steadfast against the plots and tricks by hostile forces, confidently defending the continental shelf of the country,” he stressed. Twenty-five years is not too long for people living in the mainland but it is a very long period of time for DK1 soldiers, witnessing all of their heroic struggles and silent sacrifices. For their contributions, Battalion DK1 was awarded the title “Hero of the People’s Armed Forces in the renewal period” in 2005, and various other honours and certificates of merit.